Movie Posters Etc. Orders ship within 2 business days. Shipping cost based upon package weight & destination. Shipping costs vary and are calculated by USPS at checkout based upon package weight and destination. Orders will usually ship out within 2 business days. For further information about shipping, please click on the Shipping Info & Policy link at the bottom of the page. ONLY 3 LEFT IN STOCK!!! This is a brand new, fully-licensed, 24" X 36" Style C retail movie poster for the 2015 Joss Whedon film Avengers: Age of Ultron. 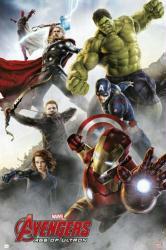 The poster features Chris Hemsworth, Chris Evans, Scarlett Johansson, and Jeremy Renner.